The principle objective of this report is to analysis Customer Satisfaction on Premium Banking Services of Brac Bank Limited. General objectives of this reports are identifying the consumers’ satisfaction level about the service of Premium Banking of BRAC Bank LTD, finding out the weaknesses of their service and making the solutions that can remove those weaknesses. Finally this report make swot analysis Customer Satisfaction on Premium Banking Services of Brac Bank Limited. Bank goal is to provide mass financing to enable mass production and mass consumption, and thereby contribute to the development of Bangladesh. BRAC Bank intends to set standard as the market leader in Bangladesh by providing efficient, friendly and modern fully automated online service on a profitable basis aiming at offering commercial banking service to the customers’ door around the country, BRAC Bank limited established 36 branches up-to this year. This organization achieved customers’ confidence immediately after its establishment. Within this short time the bank has been successful in positioning itself as progressive and dynamic financial institution in the country. It is now widely acclaimed by the business community, from small entrepreneur to big merchant and conglomerates, including top rated corporate and foreign investors, for modern and innovative ideas and financial solution. Thus within this short time it has created a unique image for itself and innovated significant solutions to contribute in the banking sector of the country. BRAC Bank Limited, with institutional shareholdings by BRAC, International Finance Corporation (IFC) and Shore cap International, has been the fastest growing Bank in 2004 and 2005. The Bank operates under a “Double Bottom Line” agenda where profit and social responsibility go hand in hand as it strives towards a poverty-free, enlightened Bangladesh. A fully operational Commercial Bank, BRAC Bank focuses on pursuing unexplored market niches in the Small and Medium Enterprise Business, which hitherto has remained largely untapped within the country. In the last six years of operation, the Bank has disbursed over BDT 11,158.15 million in loans to nearly 60,000 small and medium entrepreneurs. The management of the Bank believes that this sector of the economy can contribute the most to the rapid generation of employment in Bangladesh. Since inception in July 2001, the Bank’s footprint has grown to 36 branches, 413 SME unit offices and 48 ATM sites across the country, and the customer base has expanded to 2,58,601 deposits around 2007. In the years ahead BRAC Bank expects to introduce many more services and products as well as add a wider network of SME unit offices, Retail Branches and ATMBRAC Bank, for the first time among local commercial banks, starts providing loan facilities to small and medium trading, manufacturing and service oriented enterprises all over the country. Identifying the consumers’ satisfaction level about the service of Premium Banking of BRAC Bank LTD.
Finding out the weaknesses of their service. Making the solutions that can remove those weaknesses. BRAC Bank Limited, with institutional shareholdings by BRAC, International Finance Corporation (IFC) and Shorecap International, has been the fastest growing Bank in 2004 and 2005. The Bank operates under a “double bottom line” agenda where profit and social responsibility go hand in hand as it strives towards a povertyfree, enlightened Bangladesh. A fully operational Commercial Bank, BRAC Bank focuses on pursuing unexplored market niches in the Small and Medium Enterprise Business, which hitherto has remained largely untapped within the country. In the last five years of operation, the Bank has disbursed over BDT 1500 crore in loans to nearly 50,000 small and medium entrepreneurs. The management of the Bank believes that this sector of the economy can contribute the most to the rapid generation of employment in Bangladesh. BBL started off in July 2001, and has now grown to 26 branches, 368 SME unit offices and 54 ATM sites across the country, and the customer base has expanded to 200,000 deposit and 45,000 advance accounts through 2006. In the years ahead BRAC Bank expects to introduce many more services and products as well as add a wider network of SME unit offices, Retail Branches, POS and ATMs across the country. BRAC Bank has started with an initial capital of amount BDT 250 million, while the authorized capital is BDT 1,000 million. Over time the bank has increased it capital base because of its steady growth and within three years of operations, it has doubled its capital base to BDT 500 million. The Bank has planned to go public by the last quarter of this year (2006) and raise it’s paid up capital to BDT 1000 million. BRAC Bank originated with Local and International Institutional shareholding including BRAC as promoter with IFC and ShoreCap International, UK. Here is the break-up of BRAC Bank’s shareholdings positions. BRAC, a national, private organization, started as an almost entirely donor funded, small-scale relief and rehabilitation project initiated by Fazle Hasan Abed to help the country overcome the devastation and trauma of the Liberation War and focused on resettling refugees returning from India. Today, BRAC has emerged as an independent, virtually self-financed paradigm in sustainable human development. It is one of the largest Southern development organizations employing 97,192 people, with 61% women, and working with the twin objectives of poverty alleviation and empowerment of the poor. The International Finance Corporation (IFC) is the private sector arm and the commercial wing of the World Bank Group. IFC promotes sustainable private sector development in developing countries. Using certain channels and overseas representatives, IFC helps local financial institutions find profitable ways to target small and medium sized companies. Funding comes from the Asian Development Bank, Canada, the European Commission, the Netherlands, Norway, the United Kingdom and IFC itself. IFC is a 19% shareholder in BRAC Bank. A new assistance program signed in August 2005 aims to double the bank’s number of small and medium enterprise clients in 18 months through campaigns to target women entrepreneurs and rural clients, introduce new products and train branch managers. ShoreCap International Ltd. (SIL) is an international private non-profit, equity company seeking to invest in small business banks and regulated micro finance institutions in countries with developing and transitional economies. ShoreBank Corporation, America’s first and leading community development and environmental Banking Corporation launched SIL. ShoreBank’s international work began in 1983 advising Muhammad Yunus and for 10 years doing the financial feasibility work for the major institutional donors to the Grameen Bank in Bangladesh. Founded in mid 2003, ShoreCap has a current base of $28.3 million in capital commitments and seeks to support the growth of development finance institutions in Africa, Asia and Eastern Europe. The institution has made investments totaling $7 million in Bangladesh, India, Cambodia, Armenia, Mongolia and Kenya. ShoreBank is a 9% investor of ShoreCap and runs the management company, which oversees investment activities. ShoreCap typically invests between $500,000 and $2 million for an ownership position of 10-25% of a company. As a minority shareholder, ShoreCap seeks financial institutions with a strong, experienced management team and a committed set of local development-minded investors. ShoreCap currently owns 18% of BRAC Bank Limited. The biggest operational division of BRAC bank is the SME (Small & Medium Enterprise) Division. SME is directly related to business of the bank. 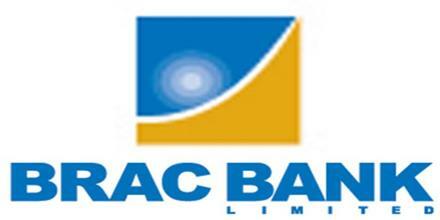 BRAC Bank extends loans to potential small and medium trading, manufacturing and service enterprises. This loan is able to provide quick and quality banking services to targeted business at any places of the country. Potential women entrepreneurs will also get the facilities of SME loan; this initiation is to play a role in the socioeconomic development of the country by expansion of business as well as creation of employment. BRAC Bank was titled to be the fastest growing bank in 2004 & 2005, and it had a profit of 14 crore taka. The profitability of the bank came mostly from the SME sector. SME division is enriched with more than 700 staffs and it has 367 unit offices all over the country. They are interdependent and work closely with each other. Retail offers different types of competitive banking products to the customers. The retail division of the BRAC Bank also offers some special types of deposits and loan scheme for the customer attention. This offers an array of products and services that are targeted towards the nonresident Bangladeshis living in different parts of the world, a milestone for BRAC bank as to becoming the pioneer in such operation. The official launching of Probashi Subidha Account took place on 16 January 2007 with a prospective to catering the beneficiaries of NRB customers with their different banking needs. With a goal to provide fast and expeditious services to deliver remittances even in the most remote corner of Bangladesh, the network of electronically connected field offices have been expanded more than 1200 BDP outlets across the country for remittance payment. In 2007 the remittance services has turned out to be one of the core business areas of the Bank. The year remained as a rewarding and successful one in terms of new tie-ups and partnerships with a focus on pursuing unexplored and niche markets around the world. February 6th 2007 marks the beginning of BRAC Bank’s Credit Cards business. Being the latest entrant into the cards market, the card division’s greatest challenge was to establish itself in an already demanding marketplace and create its own niche. In a space of one year, BRAC Bank’s today has become the fastest growing issuers of credit cards in Bangladesh. Staying true to its motto of being the banks of the masses BRAC Banks has successfully managed to penetrate and enlist a large segment of the middle class society who has adopted the plastic card as part of their everyday life. With an aim to becoming the Credit Card of choice, regular product innovations and value added services round the year ensured acquisition of new users and also aided in retention of existing clients. Aggressive promotional and brand building campaigns have created a niche that serves to distinguish BRAC Bank Credit Card from the competition. Apart from these five business units, BBL has other support units, which provide the functional assistance to smoothly run the business. Premium Banking is new service that provides customer with a comprehensive range of products and services, developed specially with customer’s superior needs in mind. Premium Banking is a personalized and privileged service that aims to provide customized banking solutions to simplify a customer’s life. High-net-worth customers and other VIPs comprise the target market. Premium Banking setup commenced in March 2006, and the design and approval of the various aspects of this new department and service were undertaken over the next six months. It was officially launched on 24th September 2006 and within a small period of time this service became very popular among a particular segment of customers. Premium Banking highlights the importance of a small customer segment, which holds a major stake of BRAC Bank’s retail portfolio. By providing relationship –based services to this customer segment, Premium Banking safeguards Bank’s Retail and SME portfolios and add to an increase in the Bank’s liability base. Maintenance of a minimum balance of deposits or cumulative credit exposure, or a combination of both (i.e. funds under management), is the basic eligibility criteria. The minimum fund under management for an individual/joint accountholders is currently BDT 2,000,000. This minimum balance is subject to change from time to time at the Bank’s discretion. Up to 4 family members may combine their deposits or cumulative credit exposure (as above) to attain a specified minimum balance. For purposes of this system of eligibility, “family members” are defined as: father, mother, brother, sister, son, daughter and spouse. The minimum fund under management for Family Premium Banking is currently BDT 3,000,000. This minimum balance is subject to from time to time at the Bank’s decision. Premium Banking may also be offered to very important or socially influential persons in lieu of the minimum balance. Head of Retail Banking retains the authority to approve applications for this service to any such persons, on a case-by-case basis. This will help to safeguard and maintain relationships with key persons who may directly or indirectly affect the bank’s reputation in the industry. Customer satisfaction and retention are critical for retail banks, as they have an impact on profit (Levesque and McDougall, 1996). However, as business leaders try to implement the concept of customer satisfaction and/or retention in their companies, employees working with customers may come to regard customer retention (Levesque and McDougall, 1996) or satisfaction (Stauss et al., 2001) as in themselves the goal of business. Regardless as to what business leaders may be trying to implement in their companies, any employee interacting with customers is in a position either to increase customer satisfaction, or put it at risk. Employees in such positions should therefore have the skills to respond effectively and efficiently to customer needs (Potter-Brotman, 1994). A similar definition is provided by Gerpott et al. (2001) who propose that satisfaction is based on a customer’s estimated experience of the extent to which a provider’s services fulfill his or her expatiations. Customer satisfaction brings many benefits. Satisfied customers are less price sensitive, buy additional products, are less influnced by competitors and stay loyal longer (Zineldin, 2000). Ovenden (1995) argues that organizations must be aware of how well or badly its customers are treated. Customers rarely complain, and when someone does, it might be too late to retain that that customer. Satisfaction increases customer retention, and customer retention depends on the substance of the relationship between parties (Eriksson and Lofmarck Vaghult, 2000). Spreng et al. (1995) examine the importance of service recovery in determining overall satisfaction, arguing that a company is more likely to retain a customer encouraging complaints and then address them, then by assuming that the customer is satisfied. Satisfied and properly served customers are more likely to return to an organization than are dissatisfied customers who could choose simply to go elsewhere (Ovenden, 1995). As the sample size of 25 was set from the concerned population for the research, survey was taken on 25 customers. The Premium Banking customers were selected by random sampling and the survey was conducted. After finishing the survey all the questionnaires were gathered and all the data from the questionnaires were put in to Microsoft Excel. Then by using the software the analysis were mainly done through graphical presentation, frequency, and percentage. Finally the implications of the analyzed data have been discussed in the result section. In case of educational qualification most of the customers are from Bachelor Degree and they are between age group 30 to 40. This shows that most of the Premium Banking clients are educated and aged. These types of customers are more concern about the service they are paying because this is the time when most of the people actually start depositing money for their future. The using period of the service may indicate another aspect of the product. As most of the Premium Banking clients are more or less with the service for a long time contrast to the very few new account holders, it shows that there might be less popularity of this service in the recent trend. It seems that BRAC Bank is promoting their Premium Banking service through their relationship managers. This is maybe because they are not promoting their product accordingly. Company website and brochure is the only source where people can know about this service but it seems like people can learn only a little from this sources. So most of the clients came to know about this service from their relationship managers and from their friends, which indicates the reference tendency instead of using specific marketing or promotion strategy. Motijheel Branch has only one computer for Premium Banking clients for their account processing activities. But there suppose to be minimum two computers for the services of Premium banking clients. ( One computer does all the tasks of two desks. As a result, customers need to wait for the service or they have to go the customer service officer for their account verification and other services. So it sometimes bothers the customers as a priory client they are not suppose to go through this trouble. It would be better if there were one more computer in the account-opening desk. Sometimes ATM goes out of service, which is a problem for customer. Customers seem to be very much disappointed regarding the credit card service charge. There is no additional customer service officer for Premium Banking. As the clients of Premium Banking are the most prioritized clients they are supposed get all the services from one desk though they are not getting any. There suppose to be a separate lounge for premium banking. As Motijheel branch is always overcrowded with customers it is very difficult to pay special attention to these clients. Bank is a financial service-oriented organization. Its business profit depends much on its customer’s satisfaction level. That’s why the authority always should be concern about their customers and the quality of service they are providing to them. Credit card charges should be immediately reversed because customers seem to be very much disappointed regarding the credit card service charge. As a premium Banking client they are not supposed to pay any charge for their credit card or ATM card, but still bank is deducting the charge by mistake. BRAC Bank should put serious effort to make sure that this sort of mistakes doesn’t happen again and reverse the charges immediately. BRAC Bank Motijheel should have bigger branch premises for increased number of customer and more sitting arrangement should be made for Premium clients. Bank should offer more facilities to the Premium Banking customers such as travel facilities, medical facilities, send flowers and cakes to customer’s birthday or any other anniversary etc. The using period of the service indicates there is only a few number of clients have signed up for this service recently. BRAC Bank should promote their product accordingly so that they can draw in new clients as well as provide quality service to existing clients. There suppose to be one relationship manager and two associate relationship managers and minimum two computers dedicated to Premium client for each branch. Though there is only one computer and one relationship manager for Premium Banking in motijheel branch. BRAC Bank authority should assign at least one associate relationship manager and one computer for Motijheel branch. There should be at least one customer service officer assigned only for Premium Banking clients to each branch, though currently there is none for PB. Consumer banking is quite a new concept in banking history, especially in Bangladesh. With the growing number of local private banks competing for customers, BRAC Bank Limited cannot hold on to their expected customer base only with their earlier reputation. It also has to ensure it’s customer satisfaction, maintain service quality and have to keep upgrading their service as well. Since the banking industry of our country is very competitive, one might want to add and innovate newer product and service to their line. Premium Banking for priority clients is a unique product of the bank that can bring more loyal customers if promoted in a planned way. It will help the bank in two ways, firstly they can keep their existing customer feel interested about bank’s product and services and secondly this strategy will help them to add more and more new customer to their portfolio. Finally, it can be said that though the results achieved so for are moderately satisfactory, Premium Banking of BRAC Bank Ltd. still possesses great potentiality. They have wonderful opportunities in the market to utilize and they can easily survive in the industry with full profitability by adopting some current relevant tactics. To keep up the expectations of their customers BRAC Bank Ltd. have to take all the necessary measures to satisfy their customers, because if the customers once realize that they are not getting proper treatment, they might switch to other bank.